We’ve had a disappointment recently in our house. My husband has been preparing for major surgery for nearly a year – we’d hoped that it would make a tremendous difference to his condition, and our lifestyle. But it turns out that he has a blood condition that would make surgery far too dangerous, and so we’ve hit the end of the road in that area of hope. I can only put it down to the faithful prayer of friends and family that we have not felt utterly despondent. Instead, we have a new hope – that God has Plan A still waiting for us. A man needs something to follow, and if Moses wasn’t around to keep God in their sights, then they would have to make their own god. 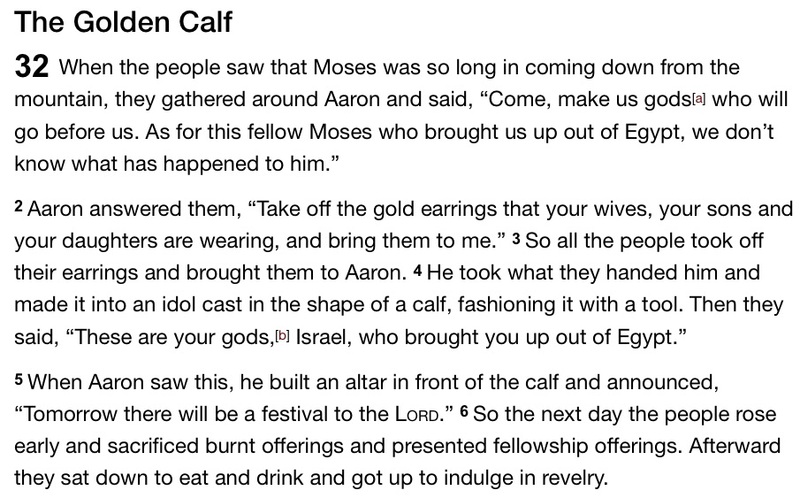 So they took their gold ear-rings – their own wealth and security – to have a clearly false god fashioned in the shape of a calf. It seems absurd to create a god. You know its origin, its maker, its defects and limitations. But it seems to be what people do, when they feel disappointed in God. So easy to turn away and put your trust in your job, your politics, your own efforts, or even your football team to get life back on track. People need something to follow, something to worship, and for many, any god will do. But when we feel God has let us down, like the Israelites, it is often that we haven’t waited long enough. Just a short while longer, and Moses would have reappeared. Waiting is hard, but believe it or not, God IS faithful. Plan A is coming. This entry was posted in Bible, Christianity, Exodus, Moses and tagged disappointment, false gods, hope, patience, waiting on God. Bookmark the permalink.